Maria Montessori was an Italian educator who began her involvement with young children more than one hundred years ago. Her observations and pedagogical method, however, continue to offer new insights into the understanding we have of young children’s learning. When Montessori first began observing children in the slums of San Lorenzo in Italy, schools of the day kept children in classrooms ‘pinned like butterflies to their desks’ and taught them largely by rote. She had radical ideas for changing this approach. She advocated freedom and independence; the opportunity to learn by active movement; and child-led learning within a prepared environment. She understood that young children learn through sensory exploration of their environment and sought to provide that for the children in her first project who were aged from two and half to six. 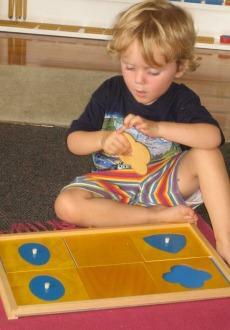 Montessori offered the children toys and a range of materials to enhance their sensory perception. She was not surprised at the children’s positive response when they were taught practical, daily living skills in a child-focused, respectful way but she was amazed at their reaction to the sensory materials. The children favoured these over the toys and appeared to revel in the exploration that they offered, concentrating on them for prolonged periods. Montessori’s aim was to develop a scientifically based education approach. She studied the work of previous educators including Froebel, the founder of the kindergarten movement, and also sought ideas from two French doctors, Jean Itard and Edouard Seguin, who had created teaching materials for children with particular learning needs. She added significantly to their innovations by developing a coherent set of auto-didactic or self-teaching materials. She trialled her ideas and kept only those that seemed to engage the attention of the children. Each of these materials stands for an abstract concept such as a colour, a geometric shape or size and they are sometimes termed ‘materialised abstractions’ because of the ideas that Montessori put into the concrete materials for the child to see, touch, hear, smell or taste. The visual chromatic sense, for example, was originally served by sets of tablets wound with differently coloured silks (now painted wood or plastic). The children begin by matching primary colours, then secondary colours and later have a set of 54 tinted tablets which they can grade. Other materials enable the exploration of size, shape, smell, taste, texture, pitch, and so on. Susan Feez (2007) an Australian language researcher, has examined the Montessori materials and suggests that they offer a challenge to the belief that education for the young child must be based upon ‘fantasy narratives….cuteness and maximal variation in order to make it palatable to young children’ (p.261). Each set of materials has a particular focus which enables the child to make independent discoveries about the relationships between the particular ‘quality’ such as the size, colour or shape that is being investigated. The teacher has a role in providing an initial introduction (or presentation) of the material and also in giving it a name. Feez contends that we can see the materials and the role of the adult as a type of ‘semiotic mediation’ which enables the young child to explore a concept in the concrete (developing what Vygotsky called a pseudo-concept); discover relationships between its qualities (e.g. big, small; big, bigger; small, smaller, smallest); recognise it as an abstract sign; and gradually to de-contextualise the concept; to think about the idea separately from the object– that is symbolic representation and then transfer that idea to recognise and describe other things. Montessori refers to the touchstone or sensitivity that young children have within them that enables them to make surprisingly accurate judgments based on their perception. She recalls an example in the children’s house in Barcelona where ‘a workman came into a classroom…with a piece of glass which he was going to put into a window in the room. A five-year-old child said in a loud voice: “You can’t use that piece of glass; it’s too small.” Only when the workman tried to fit the glass into the frame did he notice that it was about one fourth of an inch too short’ (Discovery, p. 171). I suggest you look out for the development of this kind of thinking in your own children. Feez, S. (2007). Montessori mediation of meaning: a social semiotic perspective. Unpublished doctoral thesis. University of Sydney. [Retrieved 22 February 2008 from http://hdl.handle.net/2123/1859]. Montessori, M. (1972). The discovery of the child. New York: Ballantine Books. First Published: Montessori Voices, June 2009.